You have TWO WEEKS to play along - Deadline to enter is Friday, November 6th, 2015 at Midnight CST. The winners will be announced on the NND blog on Monday, November 9th. Post your project to your blog or to an online photo gallery such as Flickr, Pinterest, or splitcoaststampers (on splitcoast please use keywords newtonsnook and IPC26). Yukari used the color combo to create this sweet flamingo card! She used our brand new Festive Flamingos stamp set! I lvo ethe pink sky! Such a fun Christmas Card! Lydia was inspired by the color combo to create this soft, snowy card using the Beautiful Blizzard stamp set! I love the ink colors over the white snowflakes and the pop of teal twine! This gorgeous flamingo card is by Samantha! 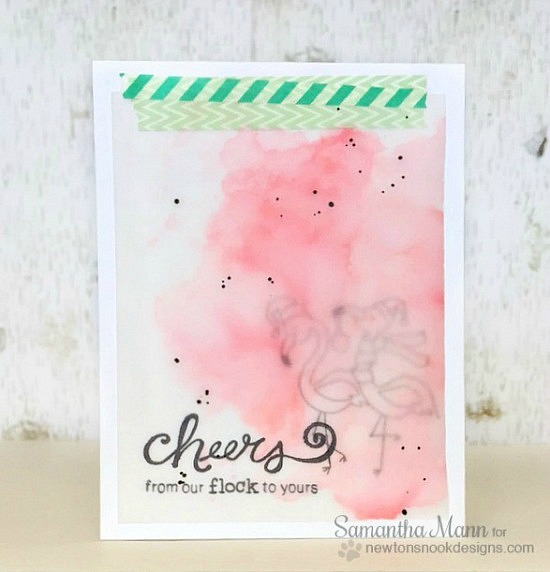 She used our Festive Flamingos stamp set to stamp the Flamingos and the "from our flock to yours" Sentiment and added on the "cheers" sentiment from the Years of Cheers stamp set! Such a fun combo and I LOVE the pink watercolored vellum too! Larissa used our Newton Loves Coffee stamp set to create her challenge card! I love the teal and pink coffee mug and the sequins that match the color palette! Such an adorable layout too! And here's a card by me (Jen)! I used the Festive Flamingos stamp set to create this sweet pink and mint card. I colored the flamingos with the challenge colors and then found some coordinating papers to put behind them! I love this fun and unique color palette for Christmas! !